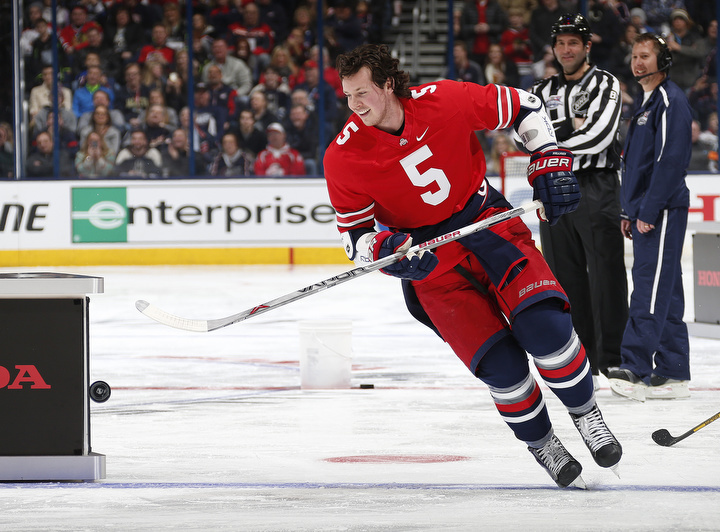 As a loyal member of the 5th Line, I wanted to honor the CBJ's first home win of the season (yes, 18 games in) with this quiz. Answer these questions about the NHL's newest franchise. The Blue Jackets are not the first NHL franchise in Ohio. Give the city AND team name of the franchise that spent two years in the state from 1976-1978. That team had relocated (and changed names) from the Bay Area, then merged with the Minnesota North Stars. The Jackets were one of two NHL expansion franchises to begin play in 2000. What was the other one? Much to the fear and/or annoyance of visiting players and reporters, how do the Jackets celebrate goals in Nationwide Arena? What rookie goaltender won the Calder Trophy in 2009 for leading the Jackets to their first playoff appearance? Identify the Czech forward (and former Flyer, Senator, Panther, Lightning, Duck, and Ranger) in this image, OR identify the former Central Division rival he is taunting in 2013 after sweeping them in a weekend home-and-home. In 2014, the Jackets won their first playoff game and first playoff home game. Name any TWO of the following: the Jacket who scored the 2OT winner in Pittsburgh for the first win; the Jacket who scored the tying goal in the final minute of regulation in Game 4; the Jacket who scored the winner in Game 4; or the Pittsburgh goalie who was victim in each case.